by Talen on December 15, 2010 in Pattaya, Thailand Event Calender, Thailand Events 5 Comments - Leave a comment! 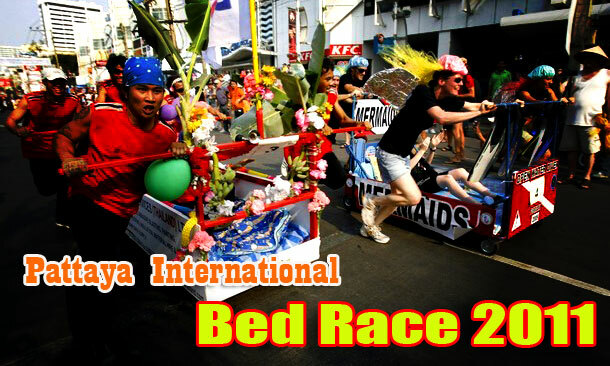 The third annual Pattaya International Bed Race will be held on Walking Street January 30, 2011. Organized by the Rotary Club of Pattaya and Pattaya City Hall, the event has been a huge success the past 2 years and looks to be a permanent event on the Pattaya calender. The Pattaya International Bed Race has been great fun for both tourists and participants alike over the past 2 years and all the proceeds go to fund the many charities that the Rotary Club of Pattaya sponsor. In just 2 years the event has raised over 300 million baht for charity. If you’ll be in Pattaya and want to take part in the Pattaya International Bed Race 2011 you can fill out an application now. The registration fee is baht 5000 per team and if you register and pay the fee before the end of December 2010 your business or team will get a one page advertisement on the official Pattaya Bed Race website. For more information on the upcoming event you can go to the Pattaya International Bed Race website and for more information on all events taking place throughout Thailand you can check the Thailand Events Calender. Pattaya International Bed Race 2010 videos. 300 Million Baht is 10 million US dollars sure this is mistake yes? I think no charity in Thailand has raised this amount of money. Pete, That’s the number they cited. Aside from donations and entrance fees the event also has some pretty big sponsors every year. This number could also reflect other charity events they have hosted throughout the 2 years as well. Talen I remember your post on this last year, it’s a great event and if they raise the kind of money stated through various sponsorships and other charity events then that’s fantastic for the benefiting charities. Pattaya’s other bed race has already started at Suvarnabhumi airport with the ‘two week terrorists’ arriving and heading off to sin city to compete in the annual Christmas and New Year Bar Girl Sack Race. 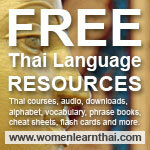 Pattaya must now be starting to get real busy. Martyn, what the Rotary Club of Pattaya is doing for local charities is really awesome. I plan on making a day of it on January 30th.